Click to check out short reads. 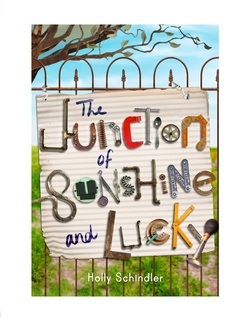 Below, you'll find two videos that describe what The Junction of Sunshine and Lucky is about. The first is the "official" version, and the second is a video like Auggie would make herself. Which do you prefer? Auggie learns in the book that beauty really is in the eye of the beholder...But "music" is also in the ear of the beholder! Click the video below to listen to the sounds of Auggie and Gus making their latest sculptures. (Sometimes, the sound of happy work is the prettiest sound of all...) Watch the volume on this one, though. Auggie's creations can get awfully loud!